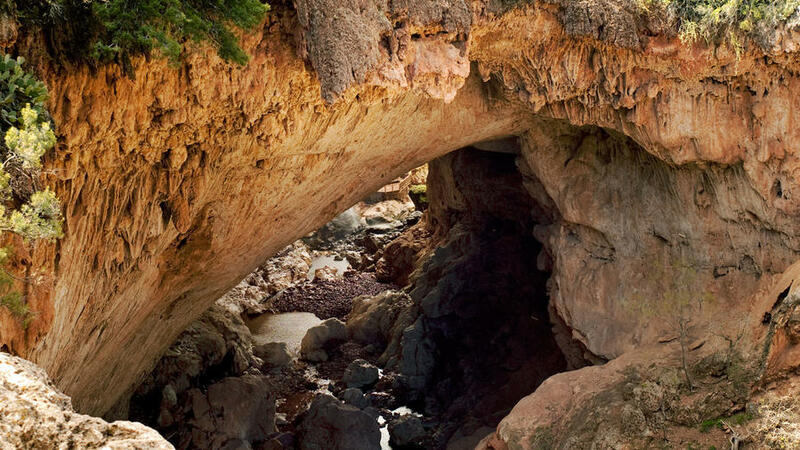 Tonto Natural Bridge State Park boasts the largest natural travertine arch in the world, measuring 183 feet. Head to Pine Creek to walk through it's massive tunnel before the state shuts down the park in September. At a temperate 5,000 feet, this forest town is your launchpad to the great outdoors. And time is running out to see nearby Tonto Natural Bridge State Park: The state plans to shutter it in September, 2010. Drive time: 90 minutes from Phoenix. Lay of the land: Payson sits just below the Mogollon Rim (“the Rim” to locals), a 200-mile stairstep between the low desert and the Colorado Plateau that’s home to the Tonto National Forest. Best of both worlds: You’ll find buckets of small-town charm in Payson; shady trails and lakes for hiking, fishing, boating, and picnicking on the Rim. Like a rodeo? Four days of roping and riding kick off on August 19 (from $18; rimcountrychamber.com). Spend a day exploring the Tonto National Forest and becoming one with nature by hiking the 3.2-mile Horton Creek Trail that runs through the heart of Payson. Roadside stop: Poke around for thousand-year-old fossils at Tonto National Forest’s Paleo Site (free; State 260, 151/2 miles east of Payson; 928/474-7900). And, yes, it’s legal to take them with you. Dig into: A hot brownie sundae at Scoops ($; 201 W. Main St., Payson; 928/474-3957). To really take in the grandeur of the 183-foot-high arch in Tonto Natural Bridge State Park (thought to be the largest natural travertine arch in the world), walk down to Pine Creek, then scramble through its 400-foot tunnel. But do it soon: This geologic gem gets mothballed September 27 due to budget cuts. $5; 11 miles north of Payson on State 87. Work up a sweat on the 3.8-mile Horton Creek Trail in Tonto National Forest, or fish or picnic at the forest’s 52-acre Woods Canyon Lake. Pick up a fishing license (from $32), then rent a boat (from $40) and reel in dinner. Forest Rd. 300, 3 miles north of State 260; 928/535-7300. You need a couple of hours to do justice to the views (and washboard sections) along the Rim Road, aka Forest Road 300, that snakes along the Mogollon Rim’s edge. The 50-odd mile dirt trace has spectacular vistas of the Tonto National Forest. Access from State 260, east of Payson, or from State 87, north of Strawberry; 928/535-7300. Savor artisanal goat cheese and goat milk fudge at Fossil Creek Creamery, where you can mingle with cutie-pie Nubian and alpine goats, as well as llamas used for guided hikes. $5 guided tours, $65 half-day llama hikes; 10379 W. Fossil Creek Rd., Strawberry. Crumpled pieces of paper litter the floor at the Zane Grey Cabin, as if the author of Riders of the Purple Sage had just left. Grey built his hunting hideout on the Rim in the early 1920s; it burned in a 1990 wildfire. This exact replica—down to the model of typewriter he used—gives you a peek into the writer’s Arizona years. $5; 700 Green Valley Pkwy., Payson. Beeline Cafe diner in Payson, AZ has been fipping burgers since 1962 and guarantees to satisfy your roadside appetite. Early risers should try the classic corned beef hash and eggs served with a side of small town sass. Waitresses call you “Sis” or “Hon” as you order corned beef hash and eggs at Beeline Cafe diner, a local institution since 1962. At lunch, go for the burgers or chili and a slice of heavenly blackberry pie. $; 815 S. Beeline Hwy., Payson; 928/474-9960. Book a room at the rustic Kohl’s Ranch Lodge and spend a weekend exploring the town. You’ll be able to hear the gurgle of Tonto National Creek from your room. With all there is to do around Payson, you’ll be itching to stay another day. Book a room at the historic Kohl’s Ranch Lodge—all fireplaces and knotty-pine splendor—and fall asleep to the gurgle of Tonto Creek. From $140.